This is a simple chess study by Dr W Speckmann. 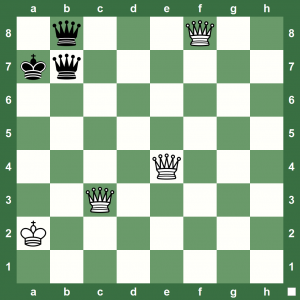 Can you help White checkmate in two? […] 1.♕ce3+ ♔a8 (1…♕b6 2.♕fa3# (0:00:06) 1.Qce3+) (1…♔a6 2.♕a4# (0:00:07) 1.Qce3+) 2.♕ea3# (0:00:12) 1.